From an year or so Google is trying to take it’s search algorithm to another level by presenting live scores, events, etc. with a simple search. You can argue that such simple one or two word queries aren’t required in this day and age of live score extensions,streams & updates. But again, if you are traveling & using your phone’s GPRS you definitely need this. Every time you won’t be sitting around a high speed broadband connection. In this post we’ll take a look at the search queries which will display the live scores or the upcoming matches/fixtures within seconds. I’m not covering all the Football leagues here; as there are quite a lot of them. I’m including the search query for each football league right after it’s name in the heading itself. For Eg : EPL is the search term to find live scores of the English Premier League matches. Now don’t jump at me saying, La Liga is more popular than EPL. I know both are at neck-to-neck. Since I follow EPL more closely than La Liga, it’s right up here. Another reason would be that, EPL has undoubtedly the most competitive football teams fighting for a top 4 spot. A strong counter-point to EPL could be that La Liga has the champion football team in the form of a certain Barcelona. Secondly, when a Messi and a Ronaldo play in the same league, then even if you don’t have enough quality teams in the league the viewers, fans will pour in to watch them play among-st each other. Italian Seria A were really giving a tough fight to both EPL and La Liga when AC Milan and Inter Milan had some quality players (more importantly in their hay days). Bungesliga brings out talented young footballers and sells them to the likes of EPL, La Liga. Bayern Munich is certainly the champion team there-in. Brazil is probably one of the well-known National Football teams. But they do have a Serie A competition to bring up young footballing talent. Again like MSL, Campeonato Brasileiro Seria A gets little/no coverage in the Asian sub-continent. 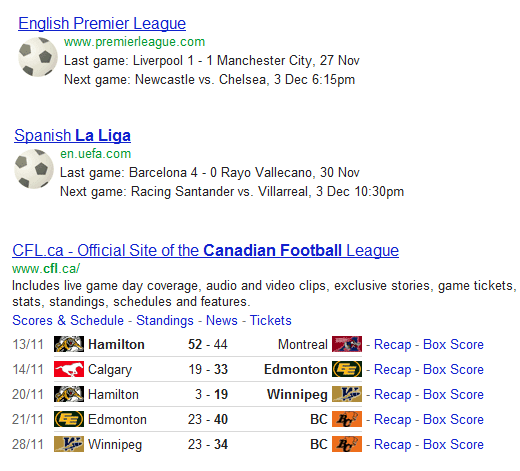 * Both MLS and CFL Live scores have been recently added to Google’s algorithm. Here is the official update from the Search team. For UEFA Euro 2012 live score alerts you can just search for Euro 2012 in Google and the scores of all the current games (or the previous one’s) will be listed in the first search result. As you can see from the above image, timings of the upcoming fixtures are also mentioned in the search result. If I missed out any important Soccer League then kindly leave a comment along with it’s name. Also note, that I have tested all these search terms on google.co.in. So there won’t be any varying results when you search on Google’s regional TLDs. Do you think Google should take the initiative of broadcasting live matches in future ? Wow, that’s cool. 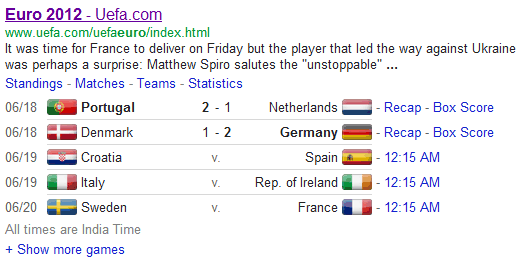 I don’t even know you can see live Football scores on Google! – Well, not that I am into football, haha! Great to know all live matches on Google.I love football and never miss a crucial game. Its like dream come true to me as I can watch clips between office time on my lappy. Perfect, I always have trouble finding the Spanish league and my favorite team Real Madrid matches. That is a great feature, I hope they make an app for it. Sometimes it is really hard to get the scores. This will make it so much easier.